Facebook has finally introduced new clickable hashtags that serve as a new way to find similar content. Unofficially, hashtags have been making themselves felt in posts on Facebook for quite some time with users using them to stress a point or to make their emotions felt. Having always been more centred on closed relationships between unknown users, there has never been a way to get a more general picture of what people are talking about on Facebook. The addition of the clickable hashtags will allow users to get this bird’s eye view. The Facebook hashtags allow you to follow individual topics in the network by opening a feed of posts that use the same hashtag or, alternatively, by letting you search for a hashtag in the search bar. The function of the hashtag is very similar to Facebook’s old ‘search all public posts’ function which also allowed users to generate a feed based on keywords. However, the new hashtags on Facebook will respect users’ privacy settings. If your security settings only allow your friends to see your posts, then only your friends will be able to see your hashtags. Secondly, if a hashtag is clicked on, or searched for, the results will list friends’ hashtag posts before other people’s hashtag posts and the use of hashtags will not impact upon the way content is allocated in the normal newsfeed. Unfortunately, at this stage the clickable Facebook Hashtags are only available on the web and not on smartphones. There is also no trending section on Facebook. 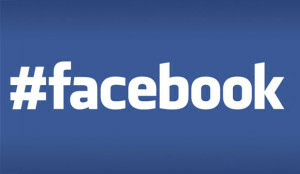 It is expected that this will change in future as Facebook continues to evolve. The new Facebook hashtags are great news for social media marketing as they provide the easiest way to track how effective advertisements are. It also has substantial implications for search engine optimisation. Whereas searching a hashtag usually led to a Twitter search result, it is likely to start directing more and more traffic to Facebook instead. This is good news for those who use Facebook to promote their products and services. It will also make finding products and services on Facebook easier since hashtags can be integrated onto other media platforms, such as Instagram, which then link to Facebook. Having a greater range of social media using hashtags also increases the benefits of associating a product, show or service with a hashtag since it will be even easier to find online. In general, the addition of hashtags to Facebook has got some people excited while others are doubtful of its usefulness. Only time will tell if Facebook Hashtags will be successful.